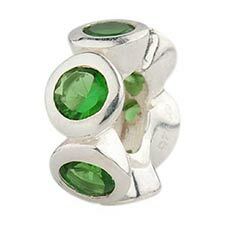 Smooth lines and emerald crystals are the focus for this bright sterling silver charm. Perfect if you want to add a little bit flash. Compatible with PERLAVITA Jewelry and most other brands of interchangeable systems. Approximate size is 10.1mm x 4.4mm x 10.1mm.